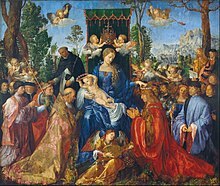 Albrecht Dürer (; German: [ˈʔalbʁɛçt ˈdyːʁɐ]; 21 May 1471 – 6 April 1528) was a painter, printmaker, and theorist of the German Renaissance. Born in Nuremberg, Dürer established his reputation and influence across Europe when he was still in his twenties due to his high-quality woodcut prints. 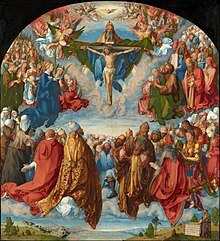 He was in communication with the major Italian artists of his time, including Raphael, Giovanni Bellini and Leonardo da Vinci, and from 1512 he was patronized by Emperor Maximilian I. Dürer is commemorated by both the Lutheran and Episcopal Churches. 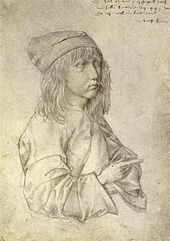 Dürer was born on 21 May 1471, third child and second son of his parents, who had at least fourteen and possibly as many as eighteen children. His father, Albrecht Dürer the Elder (originally Albrecht Ajtósi), was a successful goldsmith who in 1455 had moved to Nuremberg from Ajtós (hu; fr), near Gyula in Hungary. One of Albrecht's brothers, Hans Dürer, was also a painter and trained under him. Another of Albrecht's brothers, Endres Dürer, took over their father's business and was a master goldsmith. The German name "Dürer" is a translation from the Hungarian, "Ajtósi". Initially, it was "Türer", meaning doormaker, which is "ajtós" in Hungarian (from "ajtó", meaning door). A door is featured in the coat-of-arms the family acquired. 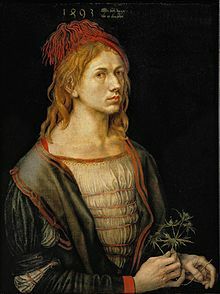 Albrecht Dürer the Younger later changed "Türer", his father's diction of the family's surname, to "Dürer", to adapt to the local Nuremberg dialect. 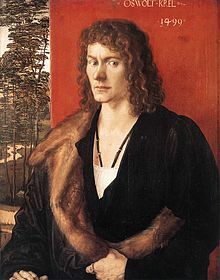 Dürer the Elder married Barbara Holper, daughter of his master when he himself qualified as a master in 1467. 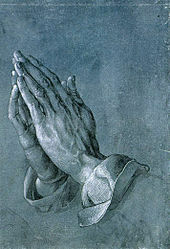 Dürer's writings suggest that he may have been sympathetic to Martin Luther's ideas, though it is unclear if he ever left the Catholic Church. Dürer wrote of his desire to draw Luther in his diary in 1520: "And God help me that I may go to Dr. Martin Luther; thus I intend to make a portrait of him with great care and engrave him on a copper plate to create a lasting memorial of the Christian man who helped me overcome so many difficulties." 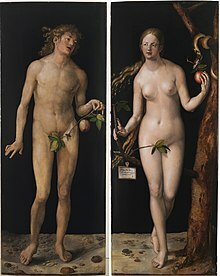 In a letter to Nicholas Kratzer in 1524, Dürer wrote "because of our Christian faith we have to stand in scorn and danger, for we are reviled and called heretics". Most tellingly, Pirckheimer wrote in a letter to Johann Tscherte in 1530: "I confess that in the beginning I believed in Luther, like our Albert of blessed memory ... but as anyone can see, the situation has become worse." 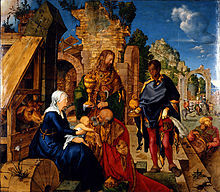 Dürer may even have contributed to the Nuremberg City Council's mandating Lutheran sermons and services in March 1525. 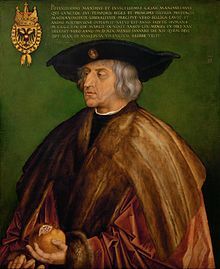 Notably, Dürer had contacts with various reformers, such as Zwingli, Andreas Karlstadt, Melanchthon, Erasmus and Cornelius Grapheus from whom Dürer received Luther's Babylonian Captivity in 1520. Dürer's work on human proportions is called the Four Books on Human Proportion (Vier Bücher von Menschlicher Proportion) of 1528. 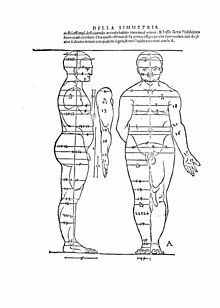 The first book was mainly composed by 1512/13 and completed by 1523, showing five differently constructed types of both male and female figures, all parts of the body expressed in fractions of the total height. Dürer based these constructions on both Vitruvius and empirical observations of, "two to three hundred living persons", in his own words. The second book includes eight further types, broken down not into fractions but an Albertian system, which Dürer probably learned from Francesco di Giorgio's 'De harmonica mundi totius' of 1525. In the third book, Dürer gives principles by which the proportions of the figures can be modified, including the mathematical simulation of convex and concave mirrors; here Dürer also deals with human physiognomy. The fourth book is devoted to the theory of movement. 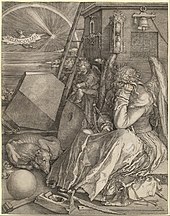 What's the good word on Albrecht Dürer?